Ultra Fine Flair: Happy π Day! To celebrate Pi(e) Day, I baked a couple of pies. 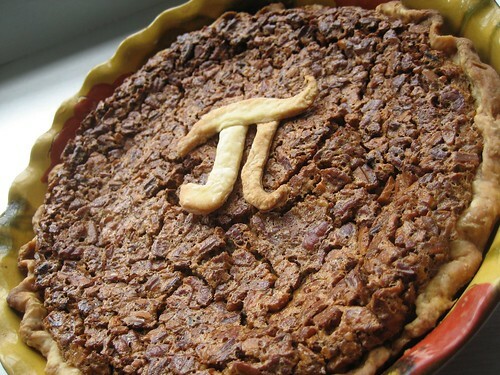 It won the coveted "Pie that Most Embodies the Spirit of Pi(e) Day" award, for its clever rendition of π in pie dough. 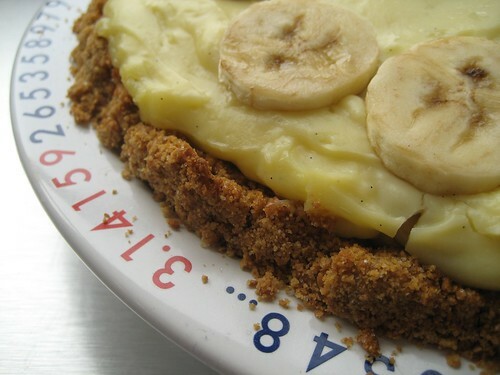 Making Banana Cream Pie is inherently funny, because you get to say things like, "I'm spreading the custard on my pie" and "Now I'm putting the banana in the custard on my pie." And those phrases make me laugh. Another thing that made me laugh was email I received that read, "Luckily no one brought 'e' to the office on 2/7 at 18:28... Phew." Hee. Now I really want a Pi plate. For next year of course.